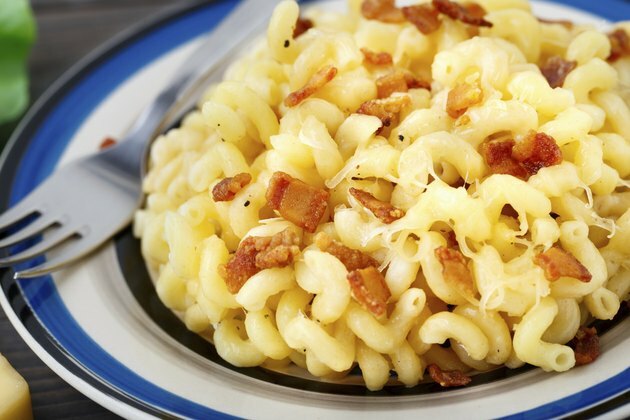 Most macaroni and cheese dishes are calorie dense. They're also high in fat and have few nutrients, so keep the portion sizes small. If you make macaroni and cheese at home, you can lighten the calorie load by reducing the butter content and using skim milk or reduced-fat cheeses. Using whole-grain macaroni instead of enriched macaroni is also a nutritional plus, as whole grain macaroni contains more fiber and nutrients. Prepared according to the package directions, one cup of macaroni and cheese made from a boxed mix contains about 376 calories per cup. Homemade versions can be slightly better; a recipe from "Epicurious" has 348 calories per cup. This is still pretty rich, but topped with steamed broccoli, bell peppers and a lean protein such as seitan, this recipe can turn into a relatively healthy meal.